Event sign at Knightdale Station Park. Source: Life Changing Transplant Foundation. 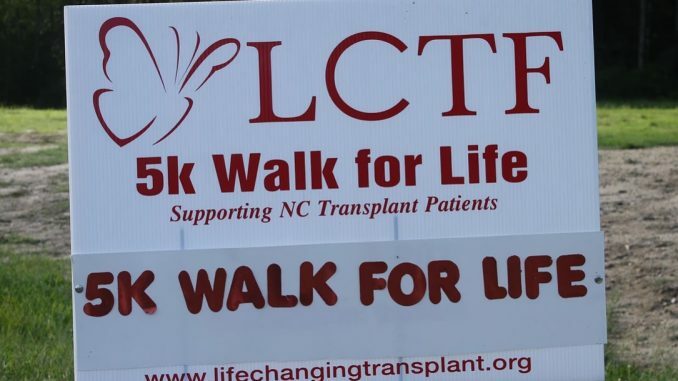 The nonprofit Life Changing Transplant Foundation (LCTF) is holding its 8th-annual 5K Walk/Run for Life on September 16, 2017. This fundraiser will be hosted at Knightdale Station Park again this year. To participate as a runner or walker, register online ($20 fee). The registration deadline is August 26, 2017. On the day of the race, sign-in begins at 8am, and the Walk/Run starts at 9pm. Once the race has been run (or walked), there will be fun for kids including face painting, a tricycle race, food, and more. Life Changing Transplant Foundation was founded in 2008, with a mission “To educate the community on the importance of organ donation and provide assistance to pre- & post-transplant patients, along with family members, with financial support. Level 1: “Break Out” sponsorship is $100. In return, sponsor will receive a complimentary logo and web link on the official event website. Level 2: “Spread Your Wings” sponsorship is $250. In return, sponsor will receive a complimentary logo and web link on the official event website, and their logo on the event banner. Level 3: “Come Fly With Me” sponsorship is $500. In return, sponsor will receive a sponsor will receive a complimentary logo and web link on the official event website, their logo on the event banner, and their name on the official event t-shirts. Level 4: “Life Changing” sponsorship is $1,000. In return, sponsor will receive a sponsor will receive a complimentary logo and web link on the official event website, their logo on the event banner, their name on the official event t-shirts, and their name in advertisements and press releases. For more information, www.lifechangingtransplant.org . To sponsor this annual fundraiser, call Gail Richburg, LCTF founder and Chairperson, at 919.771.7576.